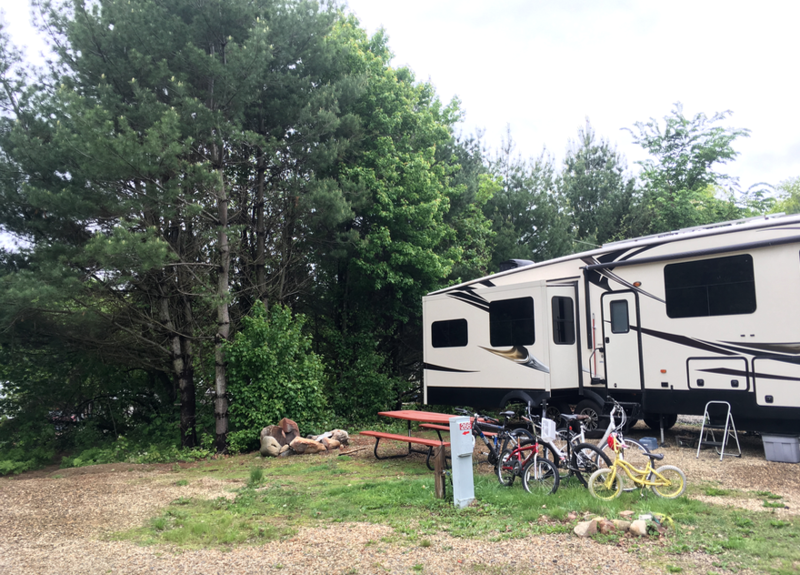 Upon arriving in our first Connecticut campground, I mentally note how fortunate we are to have a nice wooded area behind our RV for the kids to play in. Within minutes they are covering the ground rules for their makeshift game in the forest and I smile thinking about the hours of play that little grove will bring. Moments later we are greeted by the friends we’d planned to meet here. This will be the third time our paths have crossed with the Dostie family on the road; the first being in Florida this past winter and the second while in Hershey, PA. 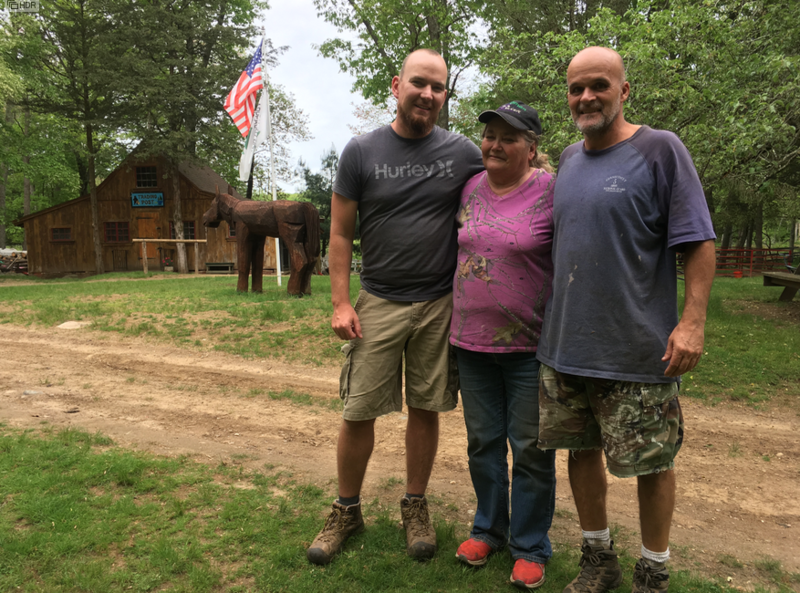 Originally from Connecticut, Frank, Shelley and their two daughters are currently work camping at this RV park. This state is infested with ticks. We need to perform tick checks on each other and our kids every time anyone comes in from playing outside–especially if they have been playing in a wooded area near trees. Tick nymphs (baby ticks) are smaller than a mustard seed and their bite is painless. This spring is unseasonably wet which means more ticks than normal. He has found at least one tick on himself every day that he has worked outside. My eyes shift sideways just in time to see Ashlyn stealthily ascending a tree trunk in the middle of the woods. I take a moment to process the information that is being spoken to me. It’s coming fast and I don’t really want any of it to apply to us. But he isn’t finished. Apparently mosquitoes and spiders may also carry Lyme’s disease so we should try to avoid those bites as well. Finally, I am brought up to speed on the local theory of the origin of Lyme disease. 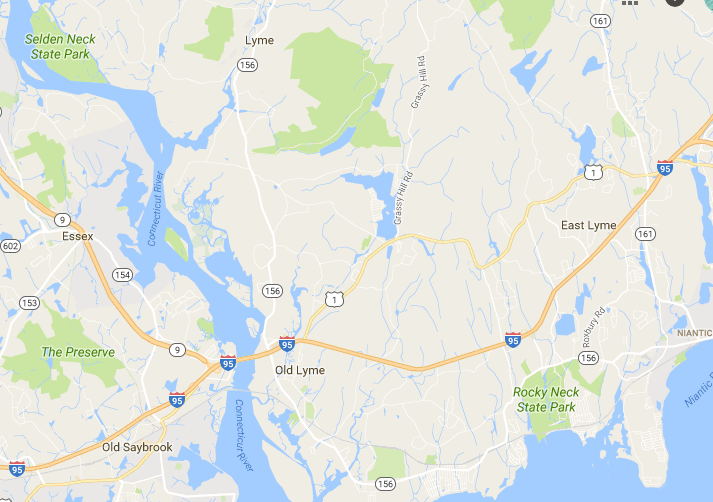 The story is that a government research project in biological warfare went bad on the island just off of Lyme, CT. The deer who swim from that island to Lyme (or perhaps even birds) apparently brought the infected ticks with them. Now Connecticut is the epicenter for the disease (with town names to prove it) and it is estimated that over 30,000 residents of the state contract the disease each year. If you really want to freak yourself out, check out this US map from the CDC which shows the reported cases of Lyme disease across the nation in 2015. I let that last morsel of info slip into my brain while I simultaneously restrain myself from abruptly commanding my children to flee from the woods to safety. But he’s not finished yet. Be aware of the poison ivy. It’s everywhere. If you see a vine growing up a tree (even if it doesn’t have leaves), most likely it is poison ivy. The oils can stay on your clothing for months. Don’t ever, ever burn it. He then proceeds to tell me about a friend who did and how he suffered a miserably long recovery in the hospital as a result. By now my head is starting to hurt and I confess that I don’t know how to identify Poison Ivy. I ask Frank to take us on a tour to learn what it looks like. He heads directly to the little forest grove behind our RV and begins pointing, “It’s here,” he says identifying plants in the area in which I had walked just moments ago. “Also, here and here.” We continue to follow him as he identifies 70% of the low lying vegetation. So basically the forest is just for enjoying at a distance, I conclude internally. I snap a photo with my phone in the hopes that I won’t forget the characteristics of this three-leaf, wickedly unsuspecting plant. Instantly, I’m homesick for the West where I somehow grew up blissfully unaware of the dangers of ticks and poison plants. The following day, Shelley and I bring the kids to Bakerwoods farm where Trent and Frank have been helping for the morning. We are given a tour of the animals (which include goats, geese, rabbits, numerous birds as well as a donkey and a peacock). 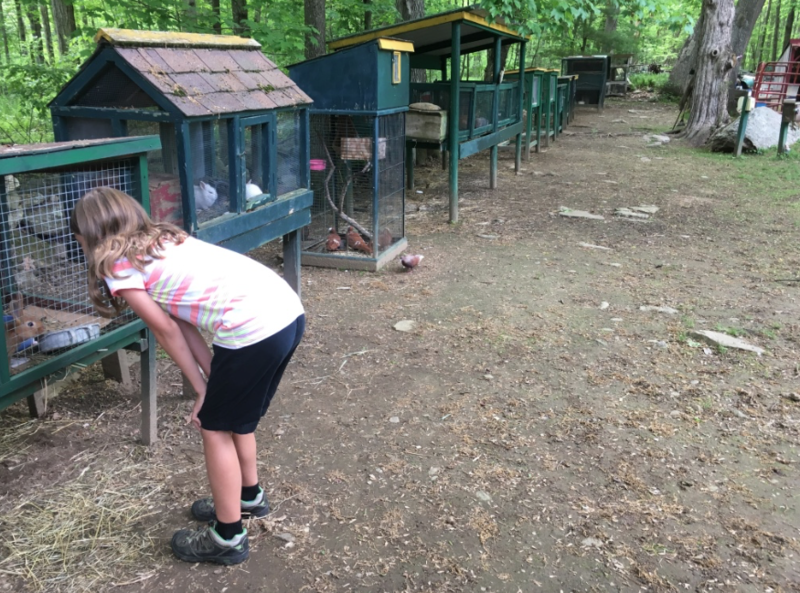 The kids run around in utter glee assigning names to every animal in sight. Meanwhile, stories begin to pour forth from Nancy, the owner, about her farm and the many adventures that she has had growing up here. Nancy tells of her mother who was left alone to raise her children without electricity while her husband went off to war. “Before my dad left he built a flag pole so my mom could raise a white flag if she ever needed help. Upon doing so, someone from the community would come to her aid.” She pauses. “The last thing my mom told me before she died was, ‘Never raise the white flag.‘” The weight of what she has just said slowly sinks in and I’m struck by her fierce independence and dogged determination. Nancy doesn’t linger however and her next story snaps me back to the present. I’m just in time to hear about the time a water snake followed her back and forth while she swam laps across the nearby pond. This story is delivered in such a nonchalant manner that I’m forced to look to the faces of the others standing around for clues to the story’s authenticity. When they chuckle and shake their head, I conclude that snakes are simply another common occurrence in the state of Connecticut. While Trent and Frank finish emptying animal stalls of manure, Shelley and I take the kids on a gnome I-spy nature walk. We work our way into the woods and I will myself not to think about the ticks waiting silently in the vegetation or the poison ivy that might be climbing along the trail. 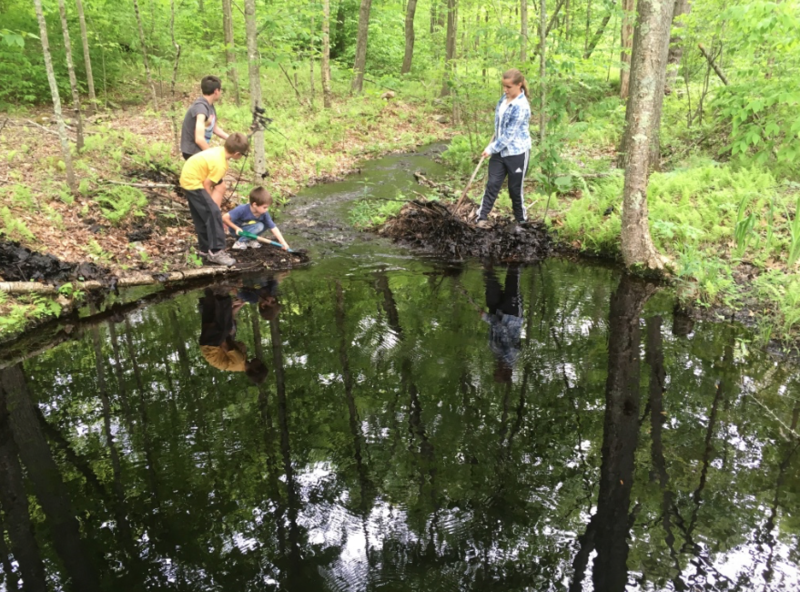 The kids busy themselves clearing beaver dams from the streams and my mind relaxes slightly. Shelley diverts from the trail to look for a letterbox previously placed a distance away. Moments later she is back wide-eyed and out of breath. “I just saw my first rattlesnake!” We gather the kids, return to the trail and make our way directly back to the farm. We are greeted by Nancy offering glass bottles of soda to the children. As they sit down to chug their strawberry flavored Hosmer Mountain Soda, Frank takes the opportunity to point out the small, black caterpillars crawling up the side of the picnic table. 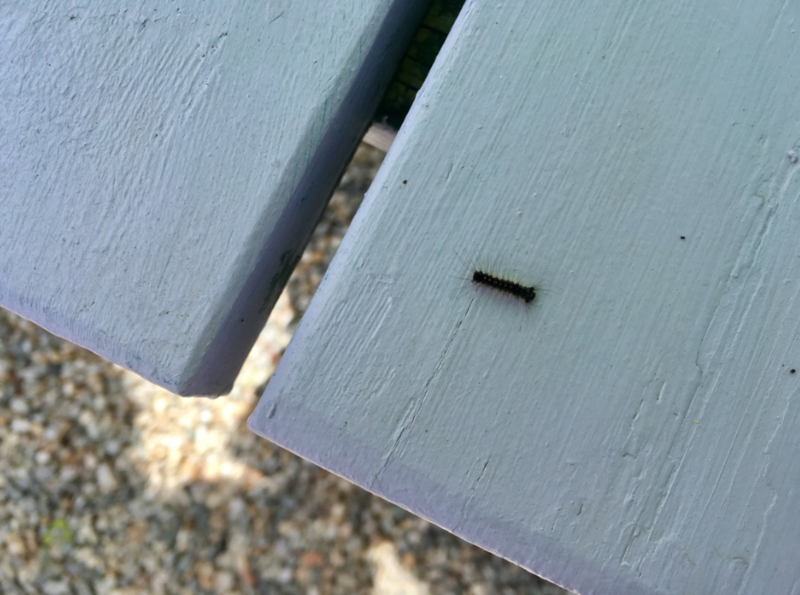 “When I was a kid we used to play with these Gypsy Moth caterpillars by the handful,” he says. “But now when you touch them, they give you a nasty rash. I don’t know what happened, but try not to touch them.” He proceeds to point out the offenders and then then turns to squash the encroaching herd of fuzzy foe. My mind wonders where that white flag is kept, I just might be needing it soon. It has now been a week and the good news is that so far we have avoided the poison ivy, poisonous snakes, troublesome caterpillars and we are getting really good at administering tick checks. Trent and I have even discovered that checking each other for ticks can be a great cover for some alone time in the bedroom. The bad news is that I feel disproportionately distracted by Connecticut’s downsides. I see the lush green forests and green rolling fields and I think, “You look so welcoming, but you are a potential pit of problems!” Please give me grace. I am still in the early states of New England grief and I’m currently working through my shock. I know Connecticut has redeeming qualities. After all, tough Nancy has stuck it out all these years without raising her white flag. I also realize that this state is not alone in her problems (ticks, poison plants and snakes can be found across the country). I need some balance here. Please tell me something YOU like about Connecticut so we can end this visit on a good note. Ticks freak me out so much! And while I get the desire for total independence, I’ve also greatly learned the value of community over the years. We’re all in this life together and I’m all about supporting each other when we need to! Yes and yes, I am in full agreement over here :)! My first thought was “run Forest run”. Why would anyone want to be there. But then I realized that I haven’t really been thinking about those things as we pull in a new place but maybe I should be. (I am always thinking of the wild animals and ax murderers that are going to get us-when we are dry camping alone). 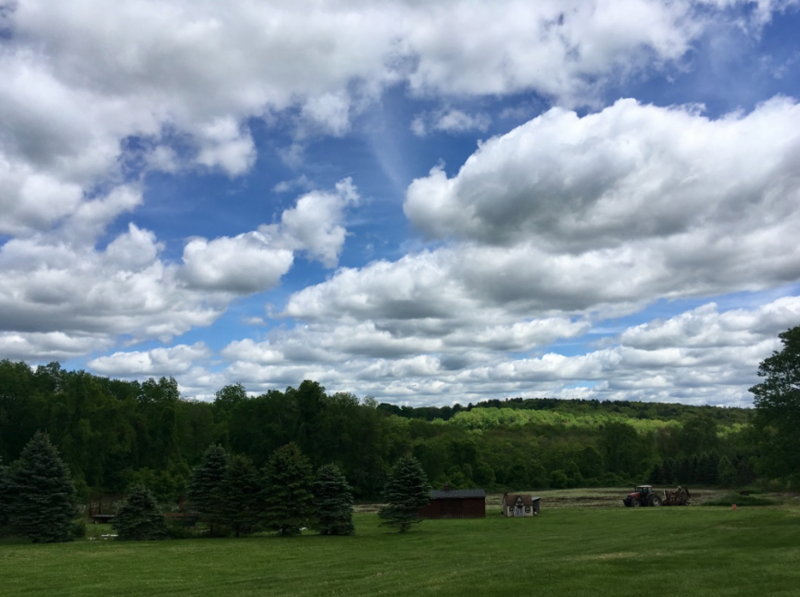 Maybe the takeaway from Connecticut isn’t necessarily about the state itself but that it was one of those times God brought people into your life to give you important information and courage (from the fact you didn’t run away) to try to see beauty in his wonderful creations. Just my 2 cents. Great thoughts! I am thankful God brought people into my life to give me that information. It’s quite likely that my kids would have been making bracelets out of the poison ivy or something of that nature if Frank hadn’t informed us :). I’m an Arizona desert rat. Snakes, scorpions, meh, no biggie. 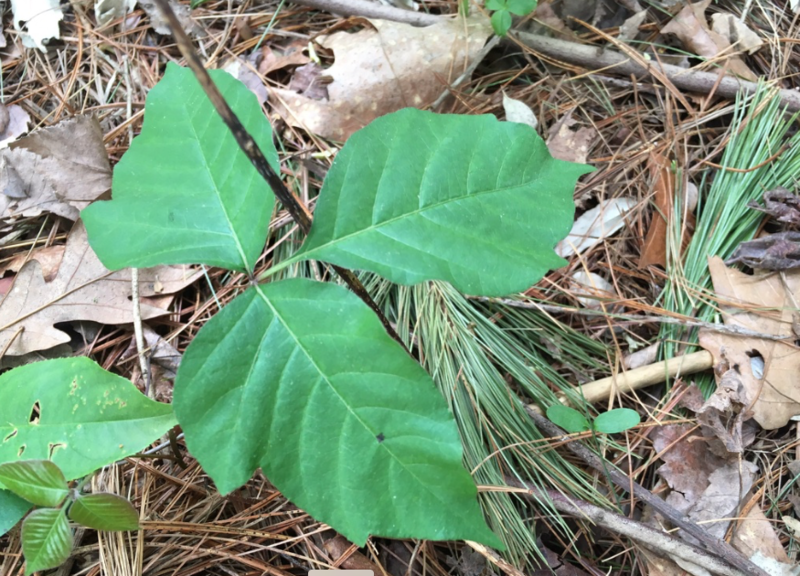 Poison ivy and ticks…ACK!!! Are you using any type of repellent or essential oils? I seriously need to know how to prevent the ticks and monster mosquitos (my boys have a serious mosquito allergy) for when we eventually head out to the east. Isn’t it funny how we get used to the dangers in our area and they don’t seem like such a big deal? Because I didn’t grow up with these things they seem scarier somehow. I have a homemade mosquito repellant using witch hazel and OnGuard essential oil but I honestly don’t know how effective it is yet because I often forget to put it on right away so when we have bites I don’t know if it is from before I sprayed us or after! :\ It does smell nice though which I can’t say for most other brands:). If you have allergies though I won’t recommend my stuff as it’s still unproven. Ticks don’t scare me one bit…..well maybe a little bit….the joints that swell and the 42 other symptoms keep me up at night with anxiety.I like to think that I have become one with nature because when my wife took me camping on our first trip in 1979 I did indeed end petting a baby skunk while she had a shower the first night. As the years went by Linda taught more about camping,tenting and nature. I have been lucky enough to encounter a Grizzly Bear driving into Banff National Park and I was thrilled to see this 1400 pound beast until I found out that he had just eaten 3 campers opening up a spot on a Friday night which they sheepishly gave to us. In January 1986 in the keys we snorkeled with a 900 pound great white shark by accident but they caught him 24 hours later and being the size of jaws I can no longer watch that 1970’s classic. So now we are selling our home to retire to Vancouver Island in 2019 to RV and camp and see the 400 cougars the most on the planet. I’m not even worried about them leaping out of the woods and landing on me because my wife has pepper spray and she said she would check them for ticks. I am glad you enjoyed it :). Ok Bruce, I feel like this line from my blog post, “This story is delivered in such a nonchalant manner that I’m forced to look to the faces of the others standing around for clues to the story’s authenticity.” could totally apply to your comment here only I don’t get to check anyones faces for authenticity. Are you being serious?! I don’t even care, that was awesome and you made me smile…especially how you all wrapped it up at the end with ticks! 😉 Comment again in the future please! We really enjoyed Connecticut! But we were only there for a day, and maybe the ticks weren’t out en force yet. 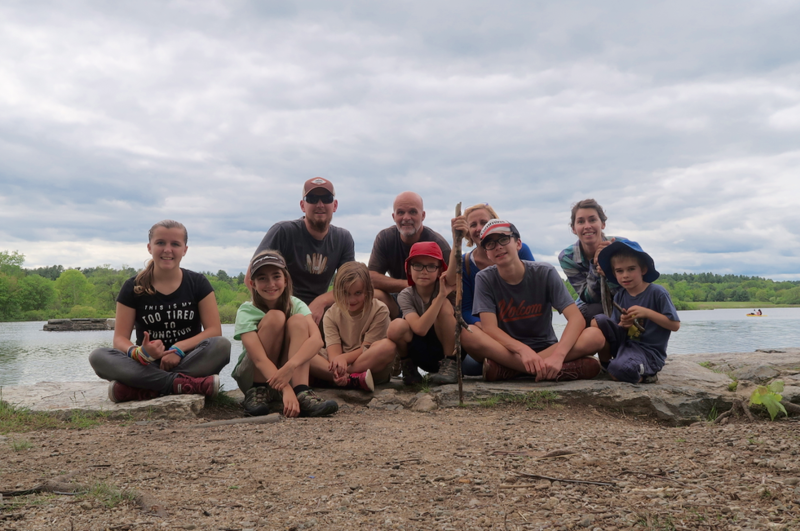 We went to Gillette state park, with a cool castle, and to mystic (and even had famous pizza!) in that picturesque harbor town. I am so glad you enjoyed it! Thank you for brining some Connecticut positivity my way :). If you spray yourself before you go out, you should be fine! Any spray with DEET or any number of natural sprays will effectively repel ticks. I walked for an hour in the woods recently and had not a tick on me. I sprayed myself first with Cutter. I always put my clothes in the wash (or dryer for 20 minutes) and shower as soon as I come in. There are pretty easy ways to fully enjoy nature and avoid ticks (which are actually just as prevalent in many other states, such as Wisconsin and California.). It’s critical to simply spray yourself before going outside, and to treat your pets monthly so they don’t bring ticks in. Not everyone gets poison ivy from the plant; you have to actually be allergic to it. Connecticut has beautiful waterfalls, parks, beaches, history….. all can be enjoyed without fear. Thank you for your wise insight. Everything you said makes sense and is doable its all just more complicated and time consuming when you are multiplying it times 6 people and the kids are going in and out, in and out, in and out to play LOL! Although ticks are prevalent in other states, my understanding is that the % of ticks carrying Lyme’s disease is not as equally prevalent in the west. Looking at a map like this one https://www.cdc.gov/lyme/stats/maps.html makes contracting Lyme’s disease seem WAY less likely if you are out of the Northeast. Having been raised in the South, ticks, venomous snakes, Poison Ivy and all the other dangers you discussed were just a way of life for us…oh, and we have alligators and sharks here too, haha. But seriously, I feel your pain. Now that I’m an adult, I cannot stand the thought of ticks! I’m totally paranoid about them. Blech. My husband and I actually lived in Connecticut for a few years, in Aquarium Wharf overlooking the Mystic River. So I second Heather’s suggestion to go there if you’re still in the area. Have a slice of Mystic Pizza. If you like sushi, try Zhang’s (if it’s still there?). Other favorites in the area: Gillette Castle, the Mystic Aquarium, and Rocky Neck State Park (which is actually where my husband proposed to me!). I’m bummed that I didn’t get this posted until we were on our way to Maine already. I guess I’ll add your lovely suggestions to my “if we ever return” list ;)! We are in Maine currently near Acadia so if you have any suggestions for this area please let me know! I grew up in New England so I laughed as I read you blog. Just another day in the woods in NE. Yup….lots of neat stuff to get in trouble with. When you grow up there you know what to avoid and what to expect. That is the charm of NE. LOL. Yes the charm ;). It certainly is pretty though! I’ll be honest, I haven’t read through this entire blog post yet. I’ve made many attempts to, but my surroundings (i.e. my KIDS) won’t let me do so in peace AND quiet. However, I did read through the first few paragraphs when you were sharing about the history of Lyme Disease. 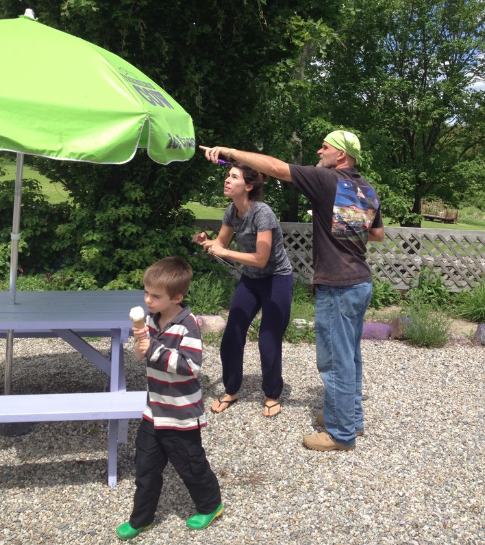 Last weekend, I learned about ‘black flies.’ The way in which I learned about them sent me into immediate panic. My 8 & 4 year old ran up to me, asking a question that wasn’t important enough for me to remember. Peering down at their head of hair, I noticed countless dark spots. Assuming it was grass, bark, or anything else from our yard, I swished their hair with my hand. Only to notice I picked up blood from doing so. I frantically sifted through their hair, only to see blood coming out from several different areas of their head. It was dripping!! I was beside myself because both boys didn’t even realize it. They didn’t feel a thing! Maybe some irritation from the blood, but not the actual bite. Seriously, their head was just oozing of blood. With the rational side of my husband taking control and thanks to Google, we learned what it was and how to “treat” it. I doused both boys with chemical-free off repellent and forced them to wear hats for the remainder of the night. They later showered off and that allowed us to see exactly where they were bitten and how many times. Thankfully, within a few days, the bite marks disappeared. My boys were not traumatized by this experience. I only wish I could say the same about myself. Oh Cori, I can relate, those black flies are nasty and sneaky! I just had a friend from Kamiah come up to your area and she told me that her girls had bleeding necks. Right away I knew what the culprit was. I am glad your boys were not traumatized. Us moms have a harder time with that, right?! Sending hugs your way! Aren’t we often so blissfully unaware as kids?! Next Next post: Is full-time RV living for you? Take this quiz to find out!